The striking facade hints at the designer luxury afforded by this immaculate residence. 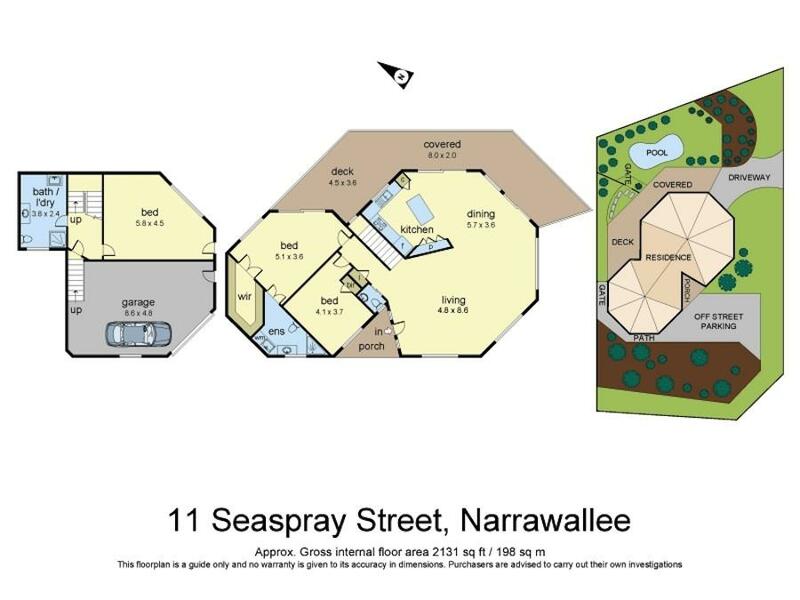 With a flexible floor plan, this coastal haven emphasises light, privacy and easy entertaining. The open plan layout showcases the extraordinary high ceilings and floor length windows capturing NE views to the ocean. The first floor consists of beautifully designed open plan family, lounge and dining through to the large kitchen, that flows seamlessly to the covered entertaining deck with ocean and natural bushland vistas complimenting the salt water inground pool below. The main bedroom with huge walk in wardrobe and ensuite with European laundry and sliding doors out to the entertaining deck. The large second bedroom is also located on this entrance level along with a good sized powder room, enabling absolute, single level living. The ground floor consists of a huge bedroom or teenagers or parents retreat or suitable for the two generational family. There is a large bathroom with laundry facilities. With this lower level having its own dedicated entrance, it could also be used as an Airbnb to earn additional income. The storage space available is seldom seen in homes and enhances the family appeal. The extensive garage has automatic doors perhaps large enough for two small cars or the family four wheel drive and work bench. There is also enough parking for an additional 2 vehicles or the caravan, motor home or boat. Situated on a corner block leading to a private cul-de-sac, there is rarely any through traffic. This impeccable home showcases cool modern style throughout with impressive proportions. Enjoying a great sense of privacy and a floor plan that takes full advantage of natural light and space. The exceptional residence is enhanced by its desirable location with distant views of the ocean and cool ocean breezes year round. Narrawallee has fast become one of the most desirable areas in the district. An inspection is a ‘must’ to appreciate what this home has to offer. - corner block with 2 additional off street parking spaces.